An Elizabeth Park Wedding is located in the Elizabeth Park Conservatory, a of the gem within the city of Hartford, Connecticut. The Conservatory is a nonprofit group that partners with the city of Hartford to maintain and preserve the magnificent gardens in Elizabeth Park. The park is most known for its beautiful rose garden. The rose garden in Elizabeth Park was the first municipal rose garden in the United States and currently is the third largest rose garden in the country. The garden began with about 190 varieties of roses and by the 1950s had come to contain almost 1,000 types. The other gardens and grounds of the park are immaculate, with enchanting treats for the eyes in any season. 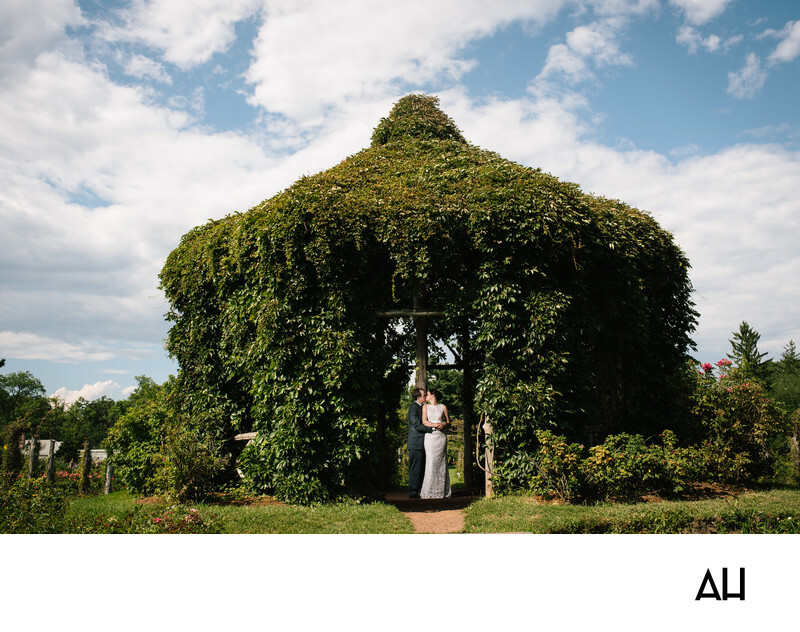 This photograph from an Elizabeth Park Wedding shows the bride and groom standing beneath an ivy covered gazebo on the park’s property. Behind them, the sky is a brilliant blue, with clouds floating over it like ships on the sea. The wooden gazebo is barely able to be seen under the blanket of leaves that cover its surface. Vibrant spots of pink and red pop up from green, drawing attention to the roses and other assorted flowers that surround the area. At the entrance of the gazebo the bride and groom stand in the opening, with sky and sunlight peeking through the leaves behind them. It is a tender moment captured between the newlyweds, with the bride wrapped up in the arms of her love. The couple share a kiss in this magical scene, looking like a prince and princess at the ending of a fairytale. This is not an ending though, for this couple the day of their wedding is the beginning of a wonderful future.